Fly fishing, in our humble opinion, is one of the most relaxing ways to spend your time on the water. I can stand there for hours, not catch a single fish, and still go home feeling as if I’ve accomplished something. While fly fishing you truly become one with nature. You have the ability to take it all in with every sense you possess. 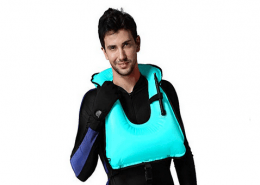 From smelling the trees and wilderness, to seeing fish in the crystal clear water and even feeling the water as it moves effortlessly around your legs. If that wasn’t enough you get the ability to use your fly fishing rod and reel as if it’s an extension of your own body. Moving it back and forth, fast at first, then easing into it as your line starts to move though your rods eyes until it reaches its final destination. Oh yea, and catching a fish is always cool! 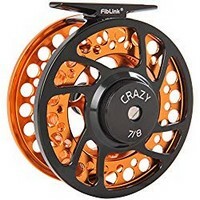 If you’re new to fly fishing or have been doing it your whole life, we believe that any of the fly reels on this page would be a great addition to any angler’s arsenal. Here are our picks for the best fly reels for the money in 2019. This reel is a great selection for general fly fishing, usable for most all species in freshwater fishing. The reel is made from finely constructed, cold forged aluminum. This is a beautiful and modern looking reel, that comes with great features for the price. GREAT VALUE! The attractive and light design stands up well though, and is resistant to wear and weathering. Use the 5 and 6 sizes for trout of panfish angling, whether dropping wets, dries, or streamers in a secluded river for rainbow or pulling poppers near the surface for bluegill. If you prefer to try for bass, pike, steelhead, or salmon, you can size up to the 7 or 8, and have plenty of capacity and power. The large arbor and smoothly tooled design make getting back on the reel a dream with this absolutely stunning fly fishing reel. Perfect when a giant steelhead starts running and you need to set the hook fast! Comes set with left handed reeling, we know how some of you lefties feel ‘left’ out sometimes. In addition to its many functional features, this reel looks and sounds great! It makes a great gift for a multi-species angler looking for a solid, all around fly fishing experience, with a reel that can back them up in the fishy situations, its one of the top fly reels. You can catch everything from trout biting on the smallest hatch to redfish and tarpon in the salt, with this smooth and versatile fly fishing reel, available in ¾ all the way up to 9/10. 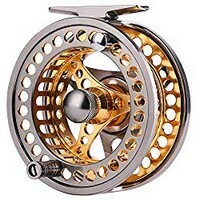 This beautiful reel is made from CNC machined aluminum alloy, the cold forged Sword is durable and resistant to corrosion and wear, they make some of the best fly fishing reels. A light wash with freshwater is all that’s needed in order to protect this reel from the salt or other harmful debris. 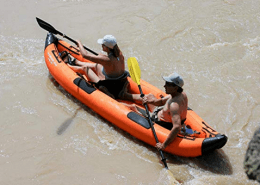 Truly perfect for ANY fly fishing application. As a medium arbor, click drag reel, the Sword Series picks up line fast, but also remains light and maneuverable. Pick up line, get on the reel, and land your catch fast, just like the professionals! You will always feel in touch and in control with this excellent reel selection, this is a very good fly reel for just about anyone. Choose the lower sizes for trout and panfish, and feel free to go after bass, northerns, steelheads, salmon, and saltwater fighters with the larger sizes. The design features make this a silent, smooth, but most importantly, a light reel. Available in sleek colors like black and gunmetal, you can also choose attractive and eye-catching pink and space grey. 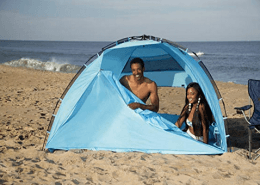 Stand out among the anglers, but pay an affordable price. This is a true all around reel. Everything about the Aoka series is smooth and fluid. Its outward appearance is modern and sleek, while its action is buttery smooth, but most of all, silent. This is for a 21st century modern angler who enjoys perfectly tuned machinery that works effortlessly and flawlessly every time. You will not believe the top quality features that are available at the price of this reel! The reel is made from completely machined aluminum, which is of the highest quality and gives this fly fishing reel a very attractive design. 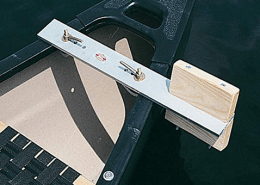 A cork/teflon drag system and midsized arbor make the cast, drag engagement, and line pick up go unbelievable smoothly. Coming in sizes 5-6 and 7-8, this reel can be used for a variety of species, and will work well with dries, wets, nymphs, streamers, poppers in medium or larger sizes. Highly recommended for salmon, steelhead, bass, and even northern pike. This reel is HIGH PERFORMANCE and comes in at an INCREDIBLE VALUE, its on of the top fly fishing reels! 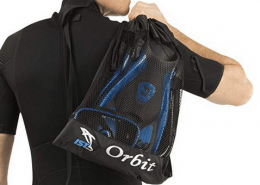 The color choices of blue/black and gunmetal/black are modern and futuristic looking, they will definitely set you apart from the standard fly fishing look. 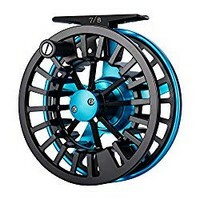 Some like the timeless look of 18th century fly fisherman; but if you would rather show off a modern, sleek, or a contemporary look, and get awesome performance, this fly fishing reel has your name all over it. Or at least it can, if you have a Sharpie nearby! When you open the box and see and feel the Sword 2, you will have two reactions – Wow this reel is LIGHT WEIGHT and HIGH QUALITY! Big things truly do come in small packages, or at least I like to think so. This is a superbly crafted aluminum reel made with brilliant machining and it’s a highly ventilated reel design. The weigh it ridiculously light, but the power and performance is not the slightest bit compromised. Designed with a midsized arbor, the reel picks up line unbelievable fast, and feels great while getting on the feel fast. 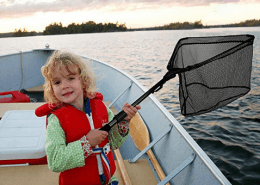 Hook and land more fish with ease! 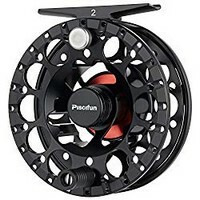 Coming in sizes 3-4 up to 7-8, this reel is great for small dries and wary trout in a slow babbling brook, pike in a lake, or a variety of inshore saltwater fishing with streamers, we couldn’t leave this one out of our fly reel reviews. This would be a fantastic choice at the 7-8 size for bonefish and redfish. 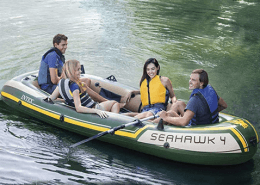 Well-made and resistant to corrosion or damage, rinsing with freshwater is all that’s needed for general upkeep, even in the ocean with that harsh saltwater. The black and green colors are both bold and unadorned, and perfect for those who want to stand out in a classy and understated way. 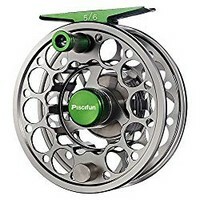 You’ll have other anglers doing double and even triple takes when you walk by with this fly fishing reel by your side. If you want to purchase a high quality, superior performing, and classic bold reel, look no further. The Fiblink system is designed to be versatile, lightweight, and yet still retain power despite its low weight. You can’t always judge a book by its cover. Crafted from quality aluminum and very ventilated, this fly fishing reel is extremely light even though it wields a large arbor. That large arbor along with 2+1 one way bearings make the performance of the reel superb and make it easy to get line on the reel ultra-fast, and gain a very high retrieval rate. 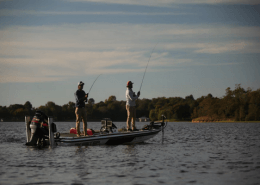 This does one thing – the main thing we judge any reel by – catch more fish by getting them on the reel and in before they can get rid of the hook. This offering from Fiblink is great for inshore saltwater fishing for reds, bones, and even tarpon, making it one of the best fly reels. With a corrosive resistant design, maintenance consists of a simple freshwater wash, which can easily be done with your nearest water bottle. Make sure to check out the attractive and sleek silver and the eye-catching orange options, both of which go so nicely with the browns and greens of nature where you do battle with your targeted species. The reel comes packaged with left hand retrieve, but can be converted easily. If you want an attractive, fast, and high performing reel, you’ve come to the right place.